I must say, I was pleasantly surprised how quickly this dish came together. I didn’t time it exactly, but I was taking my time and it couldn’t have taken more than 45 minutes. If you worked at Rachel Ray speed, I dare say you could pull it together in less than a half an hour, however I prefer to work at a more relaxed pace with minimal amounts of frenzy. The meat was so deliciously tender that you could cut it with the side of a fork. 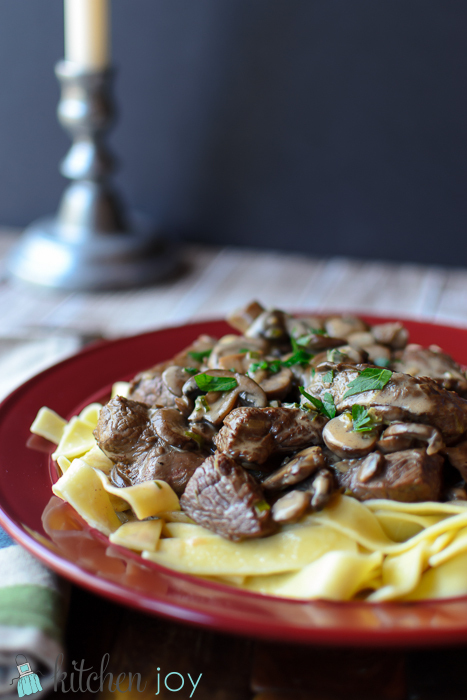 Think Beef Stroganoff, only a much better French version. I will definitely be making this again in the coming months. As with all of Julia Child’s recipes there are several steps, but if you follow the instructions, the recipes work perfectly every time. 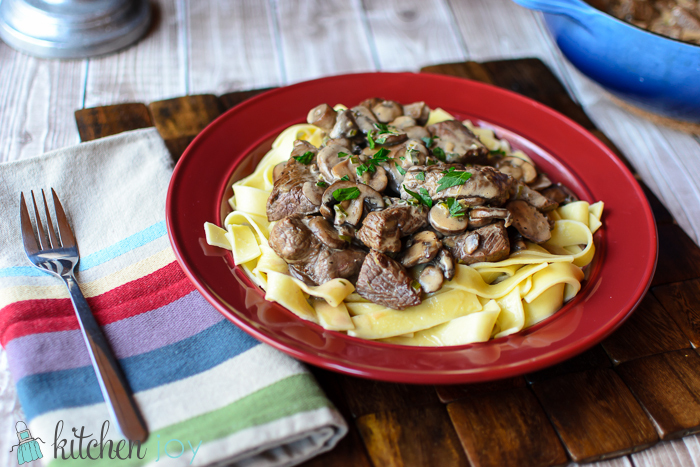 In this recipe for Beef Sauté with Cream and Mushroom Sauce you will first sauté the mushrooms, then brown the meat, then prepare the sauce, and finally bring it all back together at the end. Sauté the mushrooms in the skillet in hot butter and oil for 4 to 5 minutes to brown them lightly. Stir in the shallots or onions, and cook for a minute longer. Season the mushrooms and scrape them into a side dish. Remove all surrounding fat, and cut the filet into 2-ounce pieces, about 2 inches across and ½ inch thick. Dry thoroughly on paper towels. Place the butter and oil in the skillet and set over moderately high heat. When the butter foam begins to subside, sauté the beef, a few pieces at a time, for 2 to 3 minutes on each side to brown the exterior but keep the interior rosy red. Set the beef on a side dish and discard the sautéing fat. Pour the wine and stock into the skillet and boil it down rapidly, scraping up the browned bits in the bottom of the pan, until liquid is reduced to about 1/3 cup. Beat in the cream, then the cornstarch mixture. Simmer a minute. Add the sautéed mushrooms and simmer a minute more. The sauce should be slightly thickened. Taste carefully for seasoning. Season the beef lightly with salt and pepper and return it to the skillet along with any juices that may have escaped. 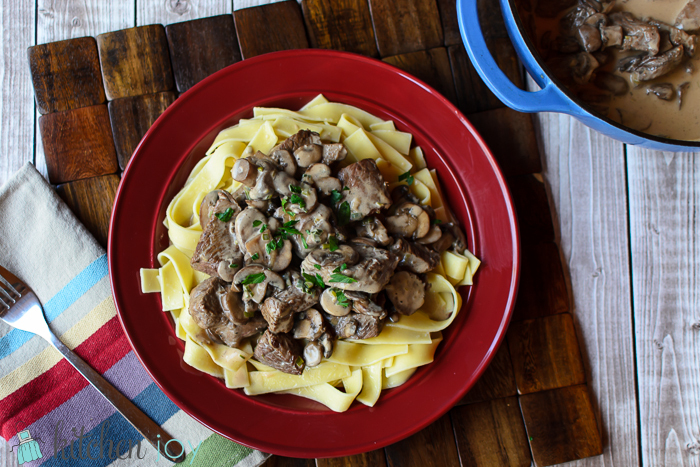 Baste the beef with the sauce and mushrooms. Garnish with parsley and serve at once. Noodles, steamed rice, boiled potatoes, or green beans could accompany this dish.